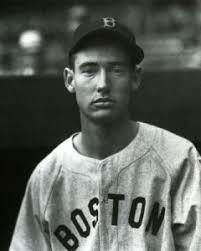 Boston Red Sox rookie Ted Williams was 20 years old when he first played in a game at Detroit's Briggs Stadium. It quickly became his favorite ballpark in which to hit. Williams — “The Kid” — had won the Triple Crown in the American Association in 1938, with 43 home runs among his contributions to the Minneapolis Millers. Williams batted left-handed and was a pull hitter. The overwhelming number of home runs he hit went to right field, or right-center. Thus far, his only major-league home run had been hit on April 23, off Bud Thomas of the Philadelphia Athletics at Fenway Park. Williams faced right-hander Roxie Lawson of the Detroit Tigers on May 4, 1939, at Briggs Stadium, the 10th game of the season for Boston. Lawson was pitching in his eighth year in the big leagues and had more than 600 innings of experience under his belt. Del Baker was managing the Tigers. Jim Bagby Jr. started for the Red Sox but he never made it through the third inning; the Tigers scored twice in the first and added two more in the third. Denny Galehouse came in and worked the next four innings. His first time up, in the first inning, Williams hit one out of Briggs Stadium — up and over the right-field roof, but “foul by inches.”1 He then lined out to center. Hitting a ball over the right-field roof was quite a feat in itself, even if foul. It was 325 feet to right field and 440 feet to straightaway center, with right-center listed at 375 feet.2 A second deck in right had been added after the 1935 season. It overhung the lower deck by 10 feet, and there was a “315” marker attached to the second deck. It was a dramatic drive, a two-run homer that halved the Tigers’ lead to 4-2. Ted came up again in the fifth inning. Lawson had walked Doc Cramer, given up a single to Joe Vosmik, and walked Jimmie Foxx. Cronin hit a bases-loaded single to score two runs and tie the game. Bob Harris was brought in to relieve. He had only 15⅔ innings of major-league experience, but had been with Toledo in the American Association in 1938 and certainly knew about Ted Williams. The righty, who had turned 24 just three days earlier, pitched around Williams, and the count went to 3-and-0. Harris likely had seen “Titanic Ted’s” first two drives out of the park, one foul and one fair. Tigers catcher Rudy York certainly saw them. Harris, on in relief with the score 4-4, had to worry about Foxx and Cronin on base. On the 3-and-0 count, John Kieran of the New York Times wrote that as York “signed for a fast ball, he looked up at Ted and said, ‘You wouldn’t think of hitting this one, would you?’‘Hit it?’ says Ted, ‘If it’s near the plate I’ll hit it outta the park.’”5 And so he did. At 120 feet, the Briggs Stadium upper deck was the “tallest barrier in either league to clear and one that the game’s greatest sluggers from Babe Ruth down had tried and never accomplished.”9 The Detroit writers called it the longest homer ever hit at the stadium. It was reportedly 17 years before another batter hit one out of Detroit’s ballpark. That batter was Mickey Mantle. Williams hit 521 homers, 248 of them at Fenway Park. Of the 273 he hit on the road, more than 20 percent were hit in Detroit. The 55 home runs he hit at Tiger Stadium far outpaced the 35 he hit at Shibe Park and the 35 he hit at Cleveland Stadium. Only one visiting player hit more; Babe Ruth hit 60 home runs in Detroit. It’s no wonder Ted called Detroit his favorite park in which to hit. One wonders how many homers he would have hit had he been a Tiger his whole career. 1 Boston Globe, May 5, 1939. 2 All ballpark measurements are from Philip J. Lowry, Green Cathedrals (New York: Walker & Company, 2006), 83, 84. 3 Boston Globe, May 5, 1939. 4 Boston Herald, May 5, 1939. 5 New York Times, January 9, 1949. 6 Boston Herald, May 5, 1939. 7 Boston Globe, May 5, 1939. 8 New York Times, January 9, 1949. 9 Boston Globe, May 5, 1939. The reporter may have not realized that Ruth's last year in the American League was 1934, before the upper deck was built following the 1935 season. 10 Boston Herald, May 5, 1939. 11 The full story of Williams’s home runs can be found in Bill Nowlin, 521 — The Story of Ted Williams’ Home Runs (Cambridge, Massachusetts, 2013). 12 Jim Prime and Bill Nowlin, Ted Williams: The Pursuit of Perfection (Champaign, Illinois: Sports Publishing, 2002), 195.